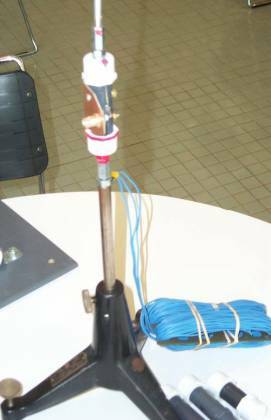 Here’s an award-winning, easy-to-homebrew, multi-band portable vertical antenna designed by long-time antenna aficionado James Bennett, KA5DVS. 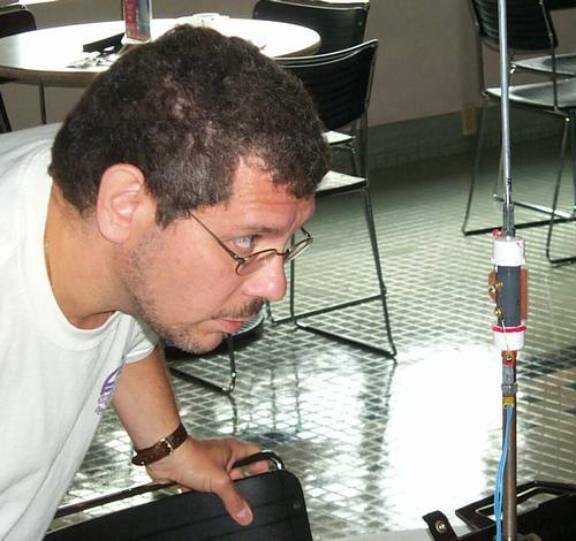 He’s documented the design and construction plans for a portable antenna that can be built with relatively ordinary components obtained from the local hardware store, including replaceable loading coils. This is a very cool antenna that's efficient and can easily be taken it along on quick trips to the field. You’ll love it! This article was originally published in issue #8 of QRP Homebrewer magazine, and is posted here with the permission of author KA5DVS and the NJQRP Club. 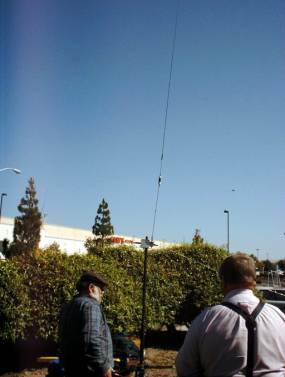 As someone who travels quite a bit on business, I am always looking for ways to take along my ham radio hobby. With the availability of a new class of small QRP rigs such as the Elecraft K1 and K2, SGC 2020 and the Yaesu FT-817, it has never been easier to take our hobby on the road ( or bus or train or boat or plane). When I first started traveling with radio equipment, I typically used a random wire and tuner to keep the total antenna package small. However, with the wire, launching weights and string as well as a tuner and SWR bridge, the entire package gets somewhat bulky. Not to mention the batteries, cables, key, microphone and other radio accessories. Keeping the total weight of luggage to a manageable level is a primary goal of mine. I have tried a few designs based around the 72" telescoping whip from radio shack coupled with an L- network tuner. While these designs proved usable, I was not happy with the configuration and portability of the design so I continued to think about a way to make a better travel antenna. Commercial antennas have come on the scene, these include designs such as the Outbacker, SuperAntennas MP1 and MP2, Maldol whips and a wide range of mobile antennas that can be adapted to portable operation. However, none of these quite fit my needs for a lightweight, packable antenna. Thus, I decided to try to build my ideal travel antenna. Building antennas is one of my favorite activities in amateur radio. I often find myself browsing for antenna materials in the local Home Depot or other hardware store. Over the years, like many of you, I have built many dipoles, verticals and a few beams from a wide assortment of wire, tubing nuts and bolts. On one such trip, I ran across some 1/4’ aluminum rod and threaded couplings and started to think how I might use these items in an antenna. That day, a pack of couplings and a couple of sections of the rod followed me home. Using a threading die, threads can be cut into the ends of the rod to allow it to screw into the couplings. Soon, I had several sections threaded. I ended up making each section 12" long as that seemed a convenient length for antenna sections. 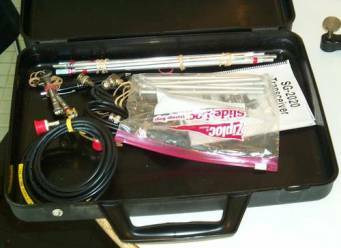 I already had several of the radio shack 72" telescoping antennas that collapse down to almost 12" as well as a good selection of PVC fittings and pipe used in previous antenna projects. After a bit work, I had an antenna that would break down into 12" or less sections and when assembled would be approximately 8’ in length. I chose to move the loading coil away from the base to improve the efficiency. Two 12" sections of the threaded aluminum rod were used to make the base section. For the coil, I used 2 PVC caps and a section of tubing along with 2 bolts, washers and nuts to produce a coil assembly. Wire from one of my other favorite haunts (Radio Shack) was used to wind the loading coil on the PVC coil form. A PVC fitting, a BNC connector and a couple more bolts, nuts and washers and the antenna was complete. I eventually named it the PAC-12 where PAC stands for Portable Antenna Concept and the 12 comes from the length when disassembled. It is also a bit of word play on the PAC-10 conference. 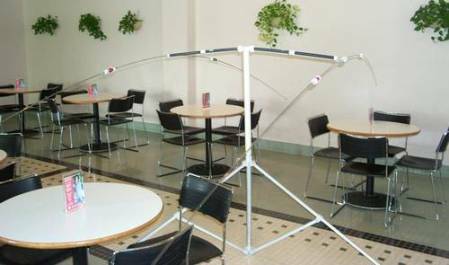 The antenna has served well on many trips and has continued to evolve, making it easier to construct and assemble for use. On a whim, I entered it in the HFPack antenna shootout held at the Pacificon conference in October 2001. I was somewhat surprised to have the antenna place first in efficiency as compared to a 1/4 wavelength wire vertical. 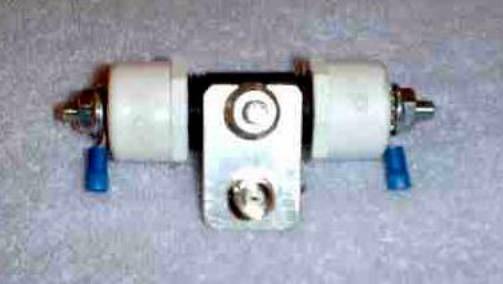 Also see Appendix C at the bottom of this page for many examples of PAC-12 antennas as constructed by QRPers in the NJQRP Club. I hope many of you will build and use this antenna, please drop me an email and let me know how it works for you. Drill bits: 1/8, 9/32, 1/4, 5/16, 3/8"
1 Aluminum Rod, 1/4" x 48"
1 PVC Riser 1/2 x 2"
PVC threaded caps, 2 per coil needed. Star Washers 1/4" and 5/16"
In order to attach the whip to the loading coils, an adapter is prepared from a 5/16" coupling nut that is drilled using a 9/32" bit for approximately 1/2 of its length. The depth is chosen to allow the antenna to slip into the fitting to just past the upper crimp line. At a distance of 1/8" from the top, it is drilled and tapped for a 6/32" screw that will serve to secure the whip. See Figure 1B. The hex coupling nut is attached to the base of the whip taking care to ensure that the setscrew applies pressure at or below the upper crimp line. The section below the crimp lines is solid and clamping here will avoid any chance of damaging the upper telescoping tubes that form the whip. See Figure 1C. Once assembled, the whip is ready to attach to the 5/16" thread end of a loading coil. The loading coils are prepared from 1/2" PVC risers that are drilled as indicated below in Figure 2 using a 1/8" bit to create a point for securing the end of the coils. The coils are wound on the PVC risers with Radio Shack # 278-1215, solid, insulated wire with the dimensions and turns indicated in the table below. The number of turns is chosen for the low end of each band and to move the resonant point higher in frequency, simply shorten the telescoping whip. Depending on location and mounting, you may find that one or more turns may need be removed to bring the low SWR point of the antenna to the proper frequency. * Note: 80m dimensions are approximate and untested as-yet. The end cap for each coil consists of a threaded PVC cap that is drilled for the end bolts. Make sure to select PVC caps that are flat on top. Some manufacturers have the top of the screw on cap domed and this will cause problems when assembling the coils. For each coil, one cap has a 1/4 x 3/4" bolt, and a 5/16 x 3/4’ bolt. 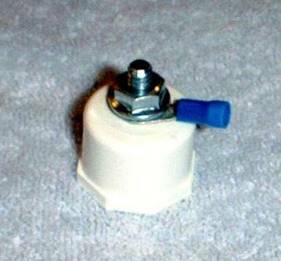 The 1/4" attaches to the antenna base sections, and the 5/16" connects to the whip base. Each bolt is passed through the cap and a ring terminal, star washer and nut are added. Tighten the nut to secure the ring terminal and prevent the bolt turning in the cap. The caps are next screwed onto the PVC riser to create the complete coil assembly. First, tighten the pvc caps onto the drilled riser. Realize that it is normal for some threads to show when the caps are in place. Adjust the position of the ends of the ring terminals to align with the holes drilled into the PVC tube by loosening the end bolts and aligning the ring terminals before re-tightening the nuts. To wind the coil, the wire is passed through one set of holes in the PVC riser and soldered or crimped to the ring terminal under one bolt. 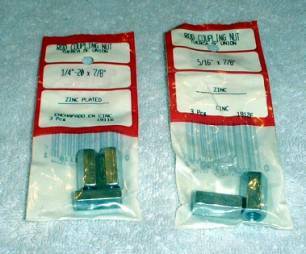 If you plan to solder the terminals, the plastic sleeves on the crimp portion can be removed to expose the metal. Once the end of wire is secured, begin winding around the PVC while keeping the turns in close contact. An easy to do this is to rotate the coil form with one hand while using the thumb of the other to feed the wire onto the form. If you need to stop winding before completion, electrical or masking tape can be used to secure the already wound turns. Continue winding to the indicated number of turns while keeping the windings close spaced and tight and secure the wire by passing through the other set of holes and connecting to the ring terminal on that end. The antenna consists of a 24" base section plus the coil and 6’ whip to form an antenna of 8’+ in length. The base section of the antenna is constructed from 1/4" diameter aluminum rod. For maximum portability when disassembled each section is 12" and has 1/4-20 threads on each end. To prepare the base section cut the 48" rod into 4 equal pieces 12" in length. To make the threading easier, bevel the cut ends of the rod using a sander or file. This will help with starting the threads straight on the rod. Be sure that the threading die is not tilted with respect to the rod axis as the threading starts. While threading, turn slightly backwards for every 1/4 to 1/2 turn forward to clear chips to clear debris from the die teeth. Thread each piece for 1/4-20" threads for approximately 3/8" distance from each end. Test the threads by screwing into a 1/4-20 coupler nut to ensure that they function smoothly. 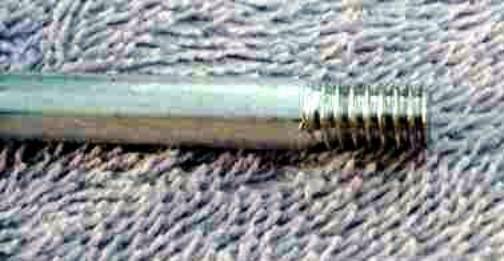 For additional guidance on creating the threaded end of the aluminum rod, please refer to the Threading section at the end of this article. The base/center insulator is constructed from a 2" PVC riser with a 1/4" hole drilled through the center as shown in Figure 8. To assemble the caps, a star washer is placed on a 1/4"-20 x 3/4" bolt before it is passed through each from the inside. A ring terminal, star washer and nut are added to the bolt on the outside and the nut tightened to secure the connection. See Figure 9. The bracket is formed from 1" x 1.5" x 1/8" flat aluminum stock that is drilled for a bolt on one end and the BNC on the other. The plate dimensions are 1 x 1.5" with a 1/4" hole centered at 1/4" from one end. At 1/2" from the opposite end, a 3/8" hole is drilled for the BNC connector. It is recommended to sand or file the aluminum to remove burrs and sharp edges. The BNC connector is installed in the plate using the supplied hardware. Next, a 1/4-20 x 1.5" bolt is passed through the PVC riser and the 1/4" hole in the flat aluminum and secured by a nut and a star washer. Approximately 1/4" of the bolt will be exposed and is used for attaching radials or for supporting the antenna if used as a dipole. Each cap is screwed onto the PVC riser and tightened. Once assembly is complete, short wires are soldered from the BNC terminals and connected to the ring terminals on each of the caps. Stranded wire is recommended as it will tolerate flexing. 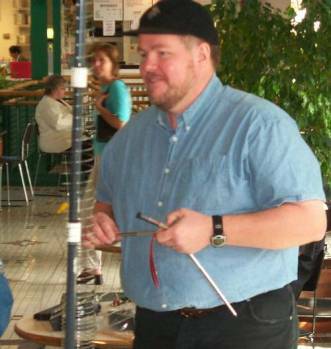 Radials are a crucial part of the antenna system for any vertical. For radial wires placed on the ground, the actual length is not critical. A convenient length such as 15’ is a good compromise between length and portability. For the PAC12, I recommend use of at least 4 radials of 15 ft each. They can be prepared from any flexible wire (stranded, speaker, zip cord etc). In this case, I used 15-conductor gray ribbon cable to produce the radials. It works well and is relatively low weight. The ribbon is separated into 5 sections of 3 conductors each. On each section, the insulation is carefully removed from approximately 1/2 inch of the ribbon and the 3 stranded wires twisted together. The sections may then be twisted together in pairs or left separate and tinned with solder. Once complete, the ends are trimmed and crimped or preferably soldered into a 1/4" ring terminal to allow easy connection to the antenna feed point or base. The point where the wire enters the ring terminal, heat shrink tubing or electrical tape can be used to provide strain relief, as the ribbon cable wires are somewhat fragile. 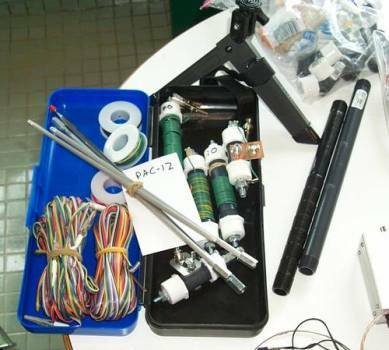 Alternatively, the radials may be connected using alligator clips rather than ring terminals. In use, the radials are deployed on the ground in as straight lines as possible in a bicycle wheel spoke pattern around the antenna base. They are connected to the coax shield side of the feed point on the shield side of the insulator or at the center bolt. Addition of a wing nut to this bolt makes it easy to connect ring terminals. Threading tools are available at most hardware and tool stores. 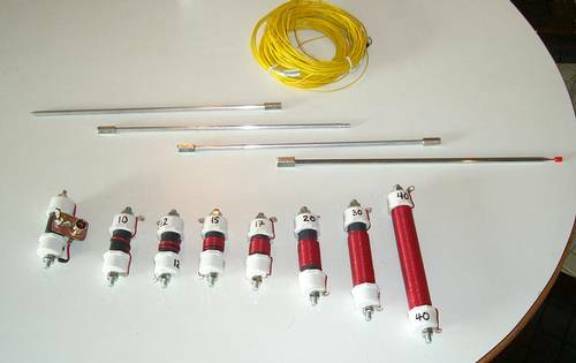 Assembly of the Pac12 vertical/dipole requires a 6-32 tap (for cutting inside threads) and a 1/4-20 threading die for preparation of the aluminum rod sections. You can purchase either separate tools or buy a tap and die set that contains a range of sizes. If you purchase the tools separately, you will need the tap, handle and a #36 drill. For the die, you will need to but a 1/4-20 die, and a handle. On examination, you will note that the threading die has cutting heads in the form of threads around the interior. The cutters are also tapered so that one side has a larger opening. When threading, the blank rod is started into the larger opening side. This allows the cutting heat to engage the rod a bit before the threading begins. Thus, the length of threads at any point will be a bit less than the thickness of the threading die. When cutting threads, it is important to work slowly. Using tapping fluid or light oil will help with the process. Turning the tool forward and then a bit backward on each 1/4 turn or so will help to keep the cutters free of debris and produce a cleaner thread. When threading rod, it is important to secure it in a vise or pliers to prevent slippage. Wooden blocks or other protective material may be used to prevent the vice jaws from marring the surface of the aluminum rod. The threads should be uniform and clean. You may find that the end of the rod will need to be filed to remove burrs after threading. Once the threads are complete, test by screwing into one of the 1/4-20 rod coupling nuts. It should thread smoothly onto the rod if not, check for burrs, damage or debris that may prevent engagement of the threads. Both ends of the two 12" rods are threaded. If you are also preparing a ground spike, thread only one end and file or sand the other to a point to allow it to be inserted into the soil.